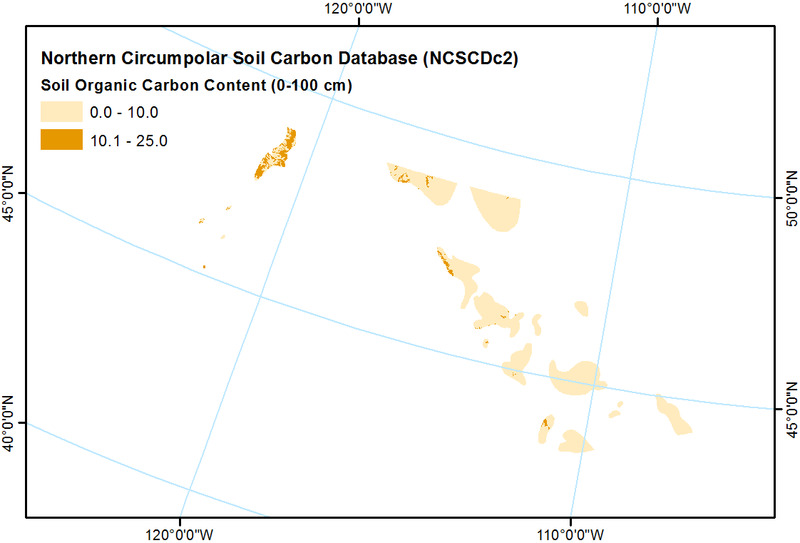 The Northern Circumpolar Soil Carbon Database version 2 (NCSCDv2) is a geospatial database created for the purpose of quantifying storage of organic carbon in soils of the northern circumpolar permafrost region down to a depth of 300 cm. The NCSCDv2 is based on polygons from different regional soils maps homogenized to the U.S. Soil Taxonomy. The NCSCDv2 contains information on fractions of coverage of different soil types (following U.S. Soil Taxonomy nomenclature) as well as estimated storage of soil organic carbon (kg/m2) between 0-30 cm, 0-100 cm, 100-200 cm and 200-300 cm depth. The database was compiled by combining and homogenizing several regional/national soil maps. To calculate storage of soil organic carbon, these soil maps have been linked to field-data on soil organic carbon storage from sites with circumpolar coverage. More information on database processing and properties can be found in the product guide. Hugelius G, Bockheim JG, Camill, P, Elberling B, Grosse G, Harden JW, Johnson K, Jorgenson T, Koven C, Kuhry P, Michaelson G, Mishra U, Palmtag J, Ping C-L, O’Donnell J, Schirrmeister L, Schuur EAG, Sheng Y, Smith LC, Strauss J, Yu Z. (2013) A new dataset for estimating organic carbon storage to 3m depth in soils of the northern circumpolar permafrost region. Earth System Science Data, 5, 393–402, doi:10.5194/essd-5-393-2013.